As tension mounts over the prospect of hostilities with Iraq, the world's major religions are increasingly pressed to find justification for war within their teachings. India is the home of Hinduism, one of the world's oldest religions and ancient religious scriptures depict epic battles with good overcoming evil. But India more recently has had to grapple with many contradictions; how does fighting a just war fit in with the doctrine of pacifism and non-violence within Hinduism? Does the present BJP government's espousal of Hindutva (or "Hindu-ness") conflict with India's secularist credentials? An excerpt from the Mahabharat, one of the two great Hindu epics reads: "If you refuse to fight this battle you'll be turning aside from your duty. You'll be a sinner." It is the god Krishna telling the reluctant warrior Arjun that he had to fight a just war. Mahatma Gandhi treasured the dialogue between Krishna and Arjun, yet he was the 20th century apostle of non-violence. And there is this apparent contradiction in Hinduism between non-violence and the battles in the epics. So where does that leave the Hindu doctrine of a just war? Perhaps surprisingly, Rajiv Vohra of the Gandhi Peace Foundation believes the Mahatma would not entirely rule that out. "He wouldn't say that there could not ever be any form of just war," says Mr Vohra referring to Gandhi. "Because for freedom, if one has to fight the oppressor and one is unable to fight through non-violence, he would certainly ask him to fight nonetheless." Hindu zealots chanted: "Jai Shri Ram" or "Long live Ram", the hero of their other great epic the Ramayana, as they pull down a mosque they believe stood on the god's birthplace in Ayodhya. The mosque was pulled down 10 years ago, but the campaign to build a temple on the site continues. Leaders of the Ayodhya movement have called it a war. That war sparked off an attack by Muslims on a train in Gujarat last year and the bloody revenge Hindu mobs then took. The BJP, the Hindu nationalist party that dominates the governing coalition in India, strongly supports the Ayodhya movement. Praful Goradia is a prominent member of that party. He does not accept that non-violence in a fundamental tenet of Hinduism. "Non-violence is something that was essentially introduced on a political scale by Mahatma Gandhi," he says. "But otherwise I think there is a distinction between violence and the reluctance to kill. "I think what is typical of the Hindu ethos is its reluctance to kill. It does not mean that we don't want to fight a war. War has to be fought, but in self defence." In contrast, the gardens in which the tombs of the Muslim rulers the Lodis stand are a favourite place the Hindu scholar Shobhita Punja to walk during her lunch break, because they are just near her office. For Shobhita Punja, there can be no just war, because any form of violence is against the principle, the tenet on which Hinduism is built. Ms Punja says: "Hinduism has as its foundation a very simple concept in which it says that everything that you see on this earth, in this cosmos - everything that you can see, you can feel, you can hear, you can smell, you can touch, everything - be it a tree or a butterfly, you or me - we all come from the same divine source." According to Ms Punja, a tree is as divine as a human and adds: "And I have to see - the whole purpose of my life is to be able to understand that one truth; that you and I are just manifestations of that same divinity. "If that is the truth, then there is no way I could ever harm you, because you are God, I am God." Hindus chant: "Om Shanti." 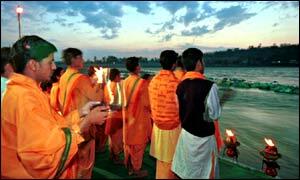 It is a sacred call for peace and is one of the most familiar Hindu mantras. Hindus have fought wars and many today believe, like Praful Goradia, that they should still be prepared to fight. But if the tenet which Shobhita Punja explained - the belief that we are all divine - is true, it makes it far harder for Hindus to justify a war than it is for those who believe God is very much separate from us, like Christians, Muslims and Jews. After all, their God can take sides in a war. But for Hindus, both sides would be divine.